Alaska is home to some of the greatest sea kayaking locations in the world. Glaciers and icebergs, wild fjords and wild forests, filled with even wilder animals make an unbelievable wilderness experience possible here, and the great Alaska coastline offer virtually boundless opportunities. Which one of the places is “the best kayaking in Alaska”? Impossible to say. The best known sea kayaking places of Alaska are the fjords and bays and channels of Southeast and Southcentral Alaska. Here are a few. Kenai Fjords is home to literally dozens of paddling options, a diversity of sea kayaking trips from half day and full day trips, overnights through to multi-week expeditions. Cool but accessible little shoreline towns like Whittier and Seward or Homer mean you can get there reasonably easily and cheaply, and find a number of local companies setup to ferry sea kayakers out to well known dropoff locations. There are a number of local outfitters and sea kayaking guide companies that specialize in the area. Cordova and Valdez areas are offer some great sea kayaking, and a number of possibilities for different types of trips. The local guides and outfitters provide a multitude of alternatives, and this has become a very popular sea kayaking destination. Whittier is another popular destination for jumping off, with easy cheap access and a number of sea kayaking options. What’s the best place for kayaking in Alaska? Icy Bay, of course. Take a look at our Icy Bay Sea Kayaking Trip. 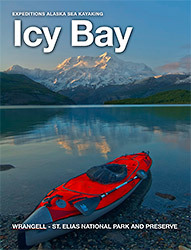 Download this eBook for a quick look at Expeditions Alaska's Icy Bay Sea Kayak trip to Wrangell - St. Elias National Park. Now where would you like to go sea kayaking? Let us know. The panhandle area of Alaska, near Yakutat, is home to Russell Fjord and Icy Bay. Icy Bay offers absolutely world class sea kayaking. Less accessible than many of the other well known locations, Icy Bay receives a fraction as many kayakers each season as virtually any other sea kayaking destination in Alaska. Icy Bay also offers views of the highest coastal mountain in the world, the largest coastal mountain range in the world, the 2nd tallest mountain in both the United States and Canada, abundant marine mammals and wildlife, sea birds, 4 massive glaciers, countless icebergs, and some absolutely of the most remote and beautiful landscapes of the Alaska coastline. It’s an amazing location and definitely my favorite sea kayaking place in Alaska. In Southeast Alaska, iconic places like Misty Fjords or Glacier Bay National Parks are well-favored sea kayaking locations. From Haines and Skagway south to Ketchikan and Sitka there are virtually an infinite number of options. Glacier Bay is one of the most popular areas. Gustavus is a great place to head out from with a number of options for ferrying you out to a base or air taxis to really get you out there. If you want specifics, contact me, or check out Jim Howard’s great book here. Wondering Where To Go Kayaking?